Queenstown is one of New Zealand’s best locations to visit. Situated on the shores of the South Island’s Lake Wakatipu, Queenstown is an outdoor enthusiast's dream holiday destination, there is no shortage of things to do here. 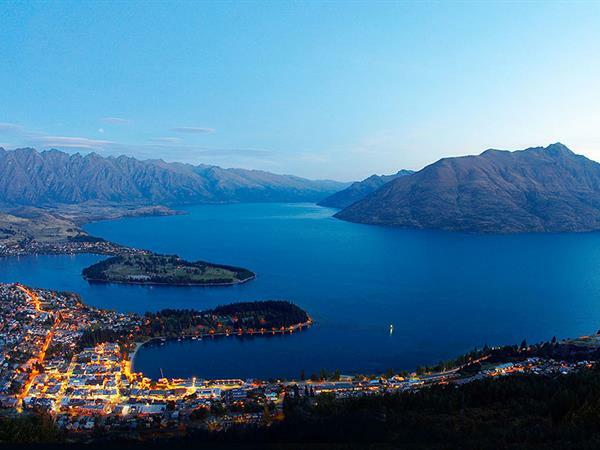 Queenstown is known for its inclusions in the famous Lord of The Rings trilogy filmed in the area. Although situated near Lake Wakatipu, there are a great deal of land activities to get involved in if you don’t want to get your feet wet. If you can walk, you can snowshoe. If you’re in Queenstown during the winter months, snowshoeing is a great activity for all ages and fitness levels. Snowshoes help you to walk across unbroken snow without sinking down to your waist, which means there’s a huge opportunity to explore places on foot. It’s a great activity for those who don’t ski, but wish to see the snowy mountains up close. The whole family can get involved as there are different trips for different ages. If you prefer to explore the snowy mountains with some furry friends, then Quiet Running is an excellent choice. To truly feel like you’re in Alaska or Russia, exploring in the wintery snow, a dog-lead sled ride should be on the cards. Dog-sled tours, lead by Siberian huskies, will take you on a journey without having to do the hard work. Not only will you see the beautiful snowy slopes on your journey, but watching the dogs pull the sled along is a sight worth seeing. While curling may not look like a glamorous Olympic sport, it’s actually a whole lot of fun. A two hour drive to Naseby means you can visit the Southern Hemisphere’s only indoor curling rink. You don’t have to be a seasoned professional because coaching is available, so you can learn the ropes and have a go at this interesting challenge. If you would rather just watch the show, there are local competitions, so you can take a seat and watch the action in all it’s glory. Now, it can be argued that cycling can be done in any location in the world, but if you want a picturesque view that is mostly level riding, then you should definitely take up the opportunity to do some cycling while you’re in Queenstown. Because it is mostly flat ground around the lake, people of any fitness level can enjoy a lovely bike ride. If you like, you can ride to nearby Frankston to the Boatshed Cafe for wine and cheese, before riding back. No matter what time of year you visit Queenstown, hiking is always a great option. You don’t have to be an athlete to enjoy a beautiful hike. Because of the varied landscape here, there are plenty of shorter hikes that include level ground if you just want to take it at a leisurely pace. However, if you see yourself as a bit of a hiking pro, you may enjoy some of the longer hikes in the surrounding areas, which can run for six to eight hours. If you’re an experienced bike rider and looking for a bit of a thrill, why not attach your bike to the skyline gondola and make your way 450 metres up a hill. When you get to the top, you can take in the breathtaking views below, before accessing one of 25 world-class downhill trails. You’ll make your way through the pine forest before getting back into town. Although a lot of the trails are for experienced riders, there are some paths that are suited to beginners. Just like the name suggests, this activity is golf with frisbees or disks. If you make your way to Queenstown Gardens, there are 18 baskets scattered around the gardens waiting for you to throw your frisbee in. It’s a fun activity, especially for the kids, and will require some skill and friendly competition. Didn’t pack any frisbees with you? That’s totally fine. There are a number of sports stores in town that hire frisbees out for less than NZD$5. If you want to see what lives in the water without getting wet, head over to the underwater observatory. In the town centre on the lakefront, you can take a look at the beautiful sea creatures that live underwater. The most surprising sight can be the diving ducks that are often seen amongst the huge trout and eels. Sure, you could ice skate anywhere, but why not do it at Queenstown Ice Arena located in Queenstown Gardens? It’s a cheap thrill on a Friday night that the whole family can get involved in. Even if you don’t know how to skate, it’s still worth a try. Taking it nice and slow is still a good night out with friends and family. If you’re here for the snow, but don’t know how to ski or snowboard (or even if you do know how to do these activities), perhaps you’d like to try out a snowmobile tour. It’s a great way to see the stunning views of the mountains, plus have access to areas that are usually too hard to visit via normal methods. When you’re 1800 metres above sea level, you’ll be able to have an exciting adventure on the snow, all whilst enjoying the view. You’ve probably heard about Zorbing - rolling down a steep hill in a giant, clear ball. You can do it in Rotorua, the town Zorbing originated in. Although a drive away from Queenstown, it’s a thrilling activity that will surely have you smiling for the rest of the day. There’s even a “Zydro” ride, which adds warm water inside the ball with you. It’s a human hamster ball experience that a lot of people definitely enjoy. It is certainly an experience that not many people can say they’ve encountered! The Kawarau Zipride is a fantastic experience for all ages and abilities. Either take a ride on your own, or join a tandem ride for up to six people at once. You can find yourself speeding up to 60km per hour for 130m along the Kawarau River. It’s the perfect activity for friends, family and children, or even perhaps a group of work colleagues. There is plenty to see and do in Queenstown. Whether you’re a thrill seeker looking for a fun adventure or perhaps you’re just looking for some activities to wind down with, there is plenty on offer to keep you entertained during your stay.